The rosary is a form of combined prayer and meditation that has been around for over 1200 years. The origin of the rosary dates back to the ninth century where Irish monks would recite and chant the 150 Psalms of the Bible as a major part of their worship. People living near the monasteries were drawn towards this beautiful and harmonious devotion, and they became very eager to join in with the monks' prayers. Unfortunately, the people were not able to adapt to this form of prayer because the psalms were very hard to memorize and printed copies of the psalms were not readily available. As a result, it was suggested to the people outside the monastery that they recite a series of 150 "Our Father" prayers in place of the psalms. As this form of devotion became increasingly popular, people started to devise methods in order to keep track of their prayers. At first, 150 little pebbles were placed inside small leather pouches to keep count. Since this method was rather troublesome, a thin rope having 50 knots on it was used instead (it was used three times for a total of 150 prayers). Eventually, the instrument of choice became the use of string with small pieces of wood. In later years, the Irish monks traveled throughout Europe and brought this form of devotion with them. In some areas, both clergy and lay people began to recite the "Angelic Salutation" (the first part of what we now know as the "Hail Mary") as part of this devotion. The popularity of this prayer led to the adoption of 50 Angelic Salutations being said for each piece of wood or knot on the prayer string. During the 13th century, Medieval theologians began to interpret the 150 psalms as veiled mysteries about the life, death, and resurrection of Jesus Christ. They began to write a series of Psalters, or praises, in honor of Jesus for each interpretation of the psalms. In addition, 150 Psalters honoring Mary were also composed. In order to fit the existing prayer string, these Psalters were divided into groups of 50 and were referred to as "Rosariums". Although "rosarium" refers to roses and rose gardens, it was used to signify a collection of prayers which could be compared to a bouquet of roses. 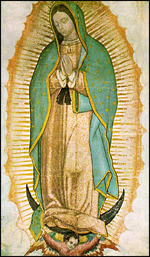 As we see today, the rose is a very popular symbol associated with our Blessed Mother Mary and it is a sign that she often uses as she did in the story of Our Lady of Guadalupe. The interpretation of the psalms into written Psalters lead to the implementation of special thoughts or meditations being attached to each bead. This innovated version of the rosary was widely spread by Blessed Alan de la Roche of the Dominican Order, as it revived the divinely inspired works that St. Dominic and his Rosary Confraternity had initiated some hundred years earlier. The prayers of the Rosarium were later broken out into sets of 10 and these groupings became known as decades. Each decade of ten "Hail Mary" prayers would be preceded by one "Our Father". Around the year 1700, the thoughts used in the rosary started to become narratives. St. Louis de Montfort composed the most common set of narratives that eventually became used as meditations for each decade of the rosary. These narratives were divided into five Joyful, five Sorrowful, and five Glorious meditations that are referred to as "mysteries". Just recently, in 2002, Pope John Paul II introduced another set of five meditations referred to as the "Luminous Mysteries". As you can see, the rosary we know today is the result of many evolutions dating back several hundred years. Although the manner in which the rosary is recited has changed, the results of praying the rosary are still the same. Countless interventions still occur today, and the power and divine graces the rosary offers are available to everyone who is willing to give it a chance.